You’d be surprised, but we actually do get asked that question at reenactments. I guess I’ve never personally heard that one, but I know many people who have. Not that I blame them. What wacko takes her 1-month-old camping? Especially when her 20-month-old is pulling at her apron strings? Roughly 5 weekend trips a year, spent with family, family friends, and kids their own age…History presented in a fun environment, surrounded by people who really know their stuff and really care about it…Camping, outdoors, and adventure, given all the parks and preserves where we camp…And a huge support system of caring people. So yeah, reenacting with babies is tough, but it’s important to us that it’s important to our family, so we make it happen. That said, I do have a lot of help out there, thank goodness. At our Highland, Indiana event last month, I couldn’t have done it alone. I wanted to post this Highland picture of my brother-in-law holding Jack, and my mother-in-law holding Ginny up because really, they’re amazing with the kids. I have other awesome helpers out there, but to anyone who knows CR and Connie, you know what I’m talking about. I guess it’s important to me to mention that we’re not just out there to have a good time, though we definitely do. We’re out there because we’re a giant family, and we support each other in our endeavor to bring living history to more and more people. 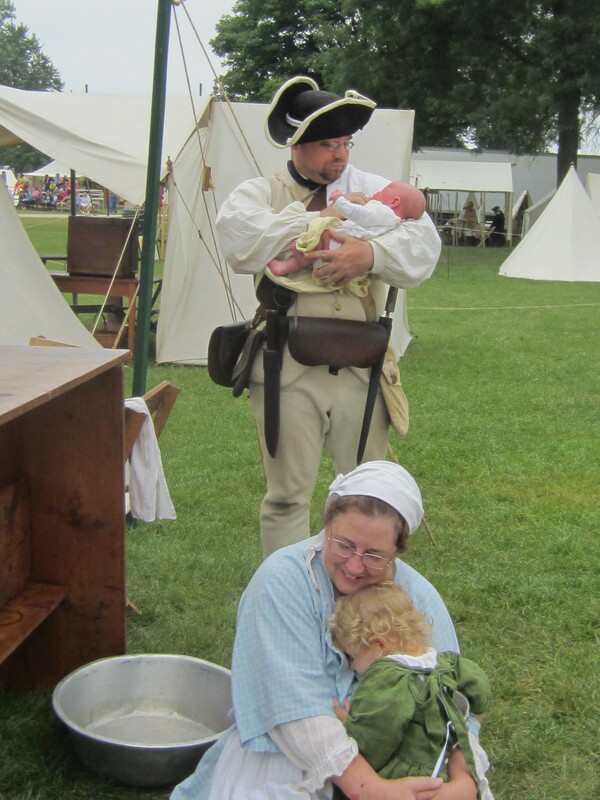 September 13th and 14th, 2014 at Cantigny Park in Wheaton, IL, we’ll be at it again. Only this time, it’s the Grand Encampment, which means it’ll be huge! Visit Cantigny.org for more information, or read this Chicago Tribune article. The event is free to come see, but there is a small parking fee ($5). This is Chicagoland after all. Come out and get a feel for what I’m talking about. And if you want to find me and talk about becoming a reenactor, ask for the Continental Marines unit and you should find me fairly simply. And yes, that 2-month-old is real. Yeah, someone walked right up to E when she was napping on a blanket at Vincennes and LOUDLY asked “Is that a real baby?” Yes, it is–and pipe down! When spectators were shocked I was actually pregnant and not faking…that takes the cake. Best. Question. Ever. But you’re right–we keep doing this crazy hobby, with tiny children, because we’re family.